A month or so ago, Pizza Hut started really pushing their new item — pizza sliders. I’m not sure why, but they looked absolutely delicious! While Pizza Hut isn’t my favorite pizza place, I really like their pan crust, and it looked like these would have that same, delicious crust. I decided this seemed like an easy recipe to duplicate. We LOVE making pizza around here, so it turned into a fun activity for Forrest and I to do together. And it may seem like there is a lot of oil in the pan, but I promise, the final product does not taste super oily. If you want to lighten it up a little, feel free to use olive oil, but it won’t have the exact taste as if you use canola. The pizzas turned out absolutely beautiful. We usually put the toppings on first, and then the cheese, which I definitely recommend doing it. It keeps the toppings from sliding around. We didn’t for the first batch, and wish we had. So if you want a fun and easy dinner, party idea (these would be awesome for a kid’s birthday! 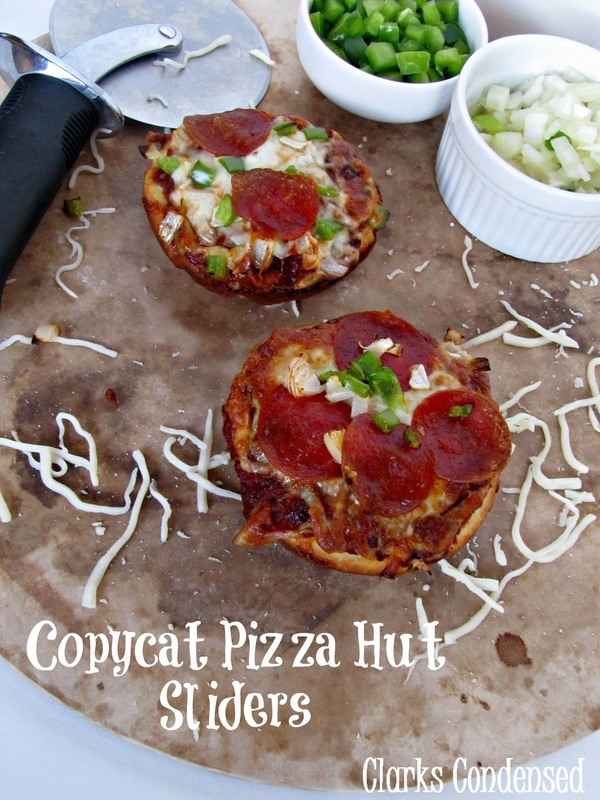 ), or have been craving those Pizza Hut sliders like I have, this is the perfect recipe for you. Granted, it didn’t taste exactly like Pizza Hut, but it’s pretty darn close. And to be honest, I think it tastes better — they weren’t so greasy, and the toppings seemed a little fresher. We did use our own favorite sauce recipe, which I’ve included below, as well as a copy cat Pizza Hut sauce recipe. When it comes to using the seasonings in the recipe we made, be careful to season to taste. Our spices are kind of old, so if you have fresh spices, you’ll want to use a little bit less. And to get the BEST pepperonis, follow this tip: Put pepperonis in a oven safe dish, and turn the oven to broil. Put pepperonis in the oven for about two minutes, and then pat dry from grease. This makes them slightly crispy, like the ones at Pizza Hut, and it gets rid of excess grease so it won’t be on the pizza. We tried this and they tasted amazing. And if you need lactose free cheese, Kraft Natural’s has a mozzarella variety. You better believe we used it! Place yeast, sugar, salt, and dry milk into a bowl and mix together. Add water, mix, and let sit for about five minutes. Add in the 2 tablespoons of oil and mix well. Slowly add in the flour. You may not need to use all four cups, so add in 1/2 cup increments, until the flour has absorbed the flour, the dough is not sticky. Make sure it is not super dense. Once you've reached the desired consistency, put the dough onto a floured surface. Knead for about 10 minutes. After kneading is completed, divide into 12-16 even pieces and roll each piece into a 4-inch circle, about 1 inch thick. In each pie pan, pour 1 teaspoon of vegetable oil. The majority of it will sit in the bottom of the pan, but be sure to coat the sides as well. Place one piece of dough in each tin, and let rise about 30 minutes. After rising, put about 1 1/2 tsp of sauce on each pizza, then desired toppings (we used onions, pepperonis, and green peppers) and mozzarella cheese. Bake at 475 for 10-12 minutes, or until the crust starts to brown and the cheese bubbles. Combine all the ingredients together. Refrigerate until ready to put on pizza. Season to taste. Combine all of the ingredients in a saucepan and bring to a boil over medium-high heat. After it begins to boil, bring down to a simmer and cover the pan for about 30 minutes. These look very tasty, in the photos, just like Pizza Hut pizza. My only concern would be the step where each 4 inch round crust dough should be 1 inch thick, before it is cooked. Did you really mean “1 inch thick”? I’m thinking that the dough thickness should be 1/8 th to 1/4 of an inch. Wow, Katie, it might take hours for a 1 inch thick pizza dough to even cook, let alone crisp up. I’d be interested in hearing from others, on the issue. Thanks for your quick reply, Katie! In the recipe for pizza hut sliders, In the start of the directions you state to combine yeast, sugar?? In the recipe there is no sugar listed. So should there be sugar or not. Good catch, Patti! Thanks for pointing that out. There should be 1 tablespoon of sugar — I’ve updated the ingredient list. Such a great idea! This would be a fun project to do with kids. We used to make pizza every Friday night as a family when all of the kids were little and then we would watch movies. This would of been even better. Oh ma gosh, I want the pizza AND the pan! My husband would LOVE these! Thanks for stopping by Mary’s Kitchen. Love the recipe! I’ve been thinking those look tasty! I’m currently into Jet’s Pizza–similar to Pizza Hut, but you can buy by the slice.